Every animal and plant has, over many generations, adapted to thrive in a particular environment. This environment is its niche -- the function or position of the species within its ecological community. A species's niche includes both the environment to which it has adapted and its role as producer and consumer of food and other resources. For example, lions and zebra both live on the East African plains, but they play very different roles there, thus they occupy different ecological niches. what is holding this animal up? 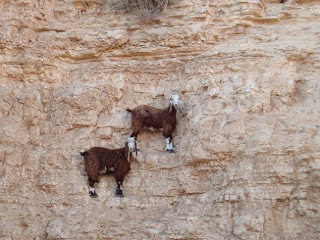 Cliff edges are just a particularly hard-to-reach niche, which is occupied by crazy mountain goats. This would not be my niche. 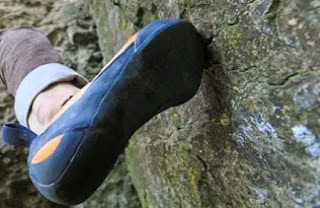 My feet are too flat, too soft, and too long for moving vertically along walls. Plus I have only 2 of them. I'm also too vertical, and my balance is fine but insufficient for life on a cliff face, which is why human beings use climbing ropes. 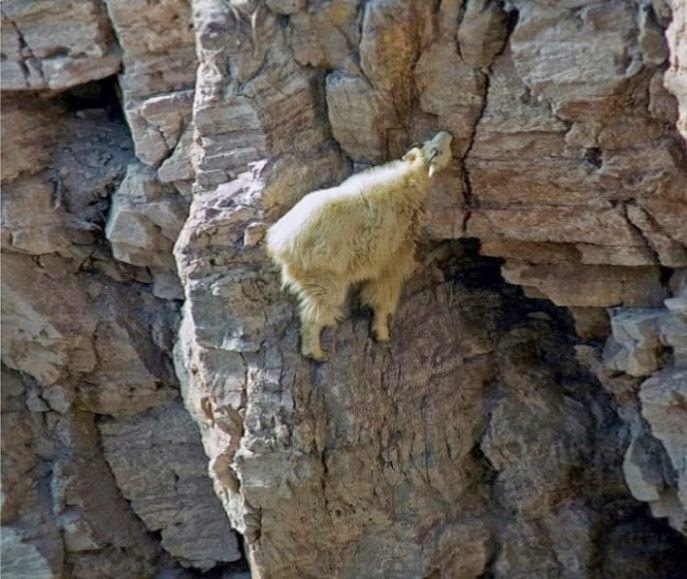 Did I also mention that I, unlike the mountain goats, cannot jump nearly 12 feet (3.5 meters) in a single bound? And I get cold really easily, which by itself eliminates me from the jagged rock playing field. 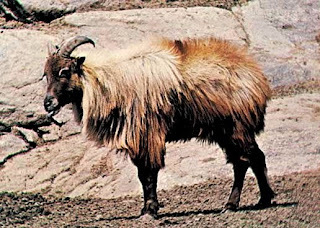 Climbing goats at higher elevations, such as the mountain goat, alpine ibex, and Himalayan tahr, have thick layered fur, though they avoid snow. They prefer windswept outcrops where their footing, while insanely precarious, is at least visible and easier to calculate. 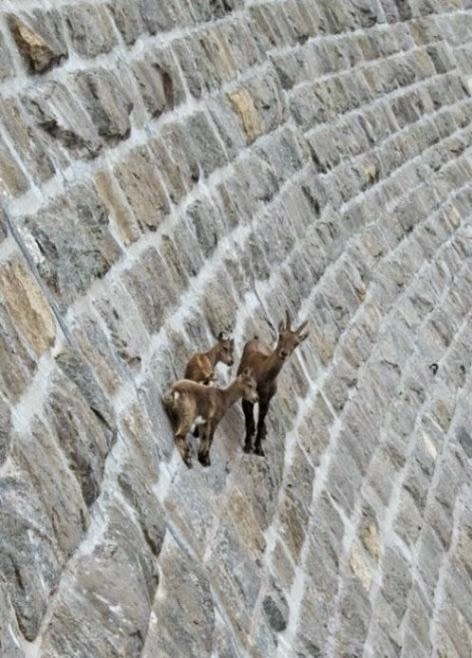 Why don't these crazy goats just live in flatter places where it is easier to walk and graze and where there is more food? Why do they trek down dangerous cliffs to get to food and water, with their young ones in tow, when they could just stay down there? What do they gain by making their everyday movements so difficult? The answer is, of course, Fitness. 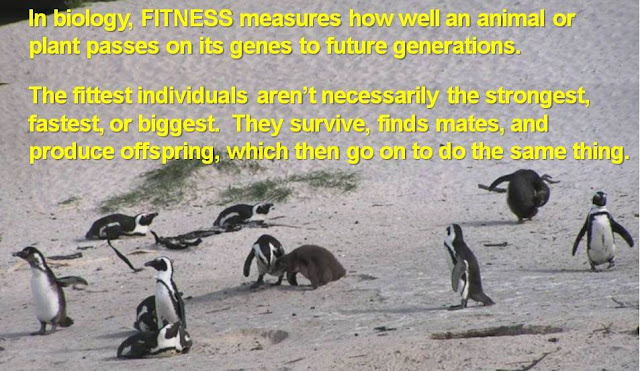 The mountain climbers with the best designs and skills survive long enough to breed and raise equally crazy daredevil young that carry to the next generation the genes for a certain body size, foot shape, fur thickness, balance, and power. Living in conditions as extreme as these cliffs actually provides the goats with benefits, including a lack of predators (but check out snow leopards), little competition for food in steep hillside grassy areas, and access to mineral-rich soils (natural salt licks) exposed by harsh winds that sweep these cliffs clear of snow. And maybe it's always sunny up there? These goats achieve their biological fitness by specializing on an unpopular habitat. So what makes them able to thrive where other animals can't? The mountain goat from North America (which is technically a goat-antelope), as well as the actual goats, including ibex and chamois, all have cloven (split) hooves that can spread apart to help them grip the ground surface, regardless of the angle of the ground below them. 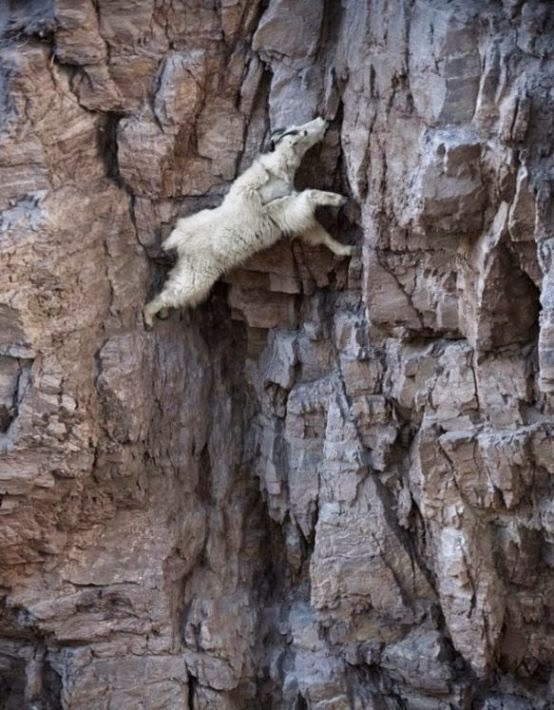 The hooves have strong hard edges that can take the beating of the rock face and rough but softer pads in the center that help the goats hang on to tiny cracks in the uneven surface. Think of the grippy surface of a climbing shoe and you'll get the idea. Alpine ibex appear oblivious to falling, no matter how steep the terrain!